I sat on on the couch at Annie and Sean’s St. Louis apartment, holding a creased paper map up to my nose. A glass of water in one hand, my iPhone in the other, I was intently focused on the research in front of me. The white background of the state of Illinois lay on the table, criss crossed with a spiderweb of highways – a spiderweb of possible roads we could travel. Looking out on a pair of tall, straight pine trees outside our friends’ apartment building, the land east of the Mississippi remained fuzzy in my mind’s eye, a blank slate of possibility. We had been lucky, up to this point, to follow a line of bicyclist-approved highways and county roads and bike paths across the country through Washington, Idaho, Montana, North Dakota, South Dakota, Iowa, Nebraska, Kansas, and Missouri. We’d met cyclists along the way who kept us company at campgrounds, stopped at gas stations with us, ate lunch with us outside of grocery stores, and kept our spirits high. This was mostly due to the hard work of the Adventure Cycling Association (ACA), a nonprofit based out of Missoula, MT whose entire mission is to inspire and empower cyclists to travel by bike across our great states. They have published about 30 routes throughout the country, both long and short, to make sure people like us can safely get from place to place. In our case, we’d been following their Northern Tier and Lewis and Clark bike routes, but our carefully chosen route had a bit of a gap between St. Louis and Cincinnati. 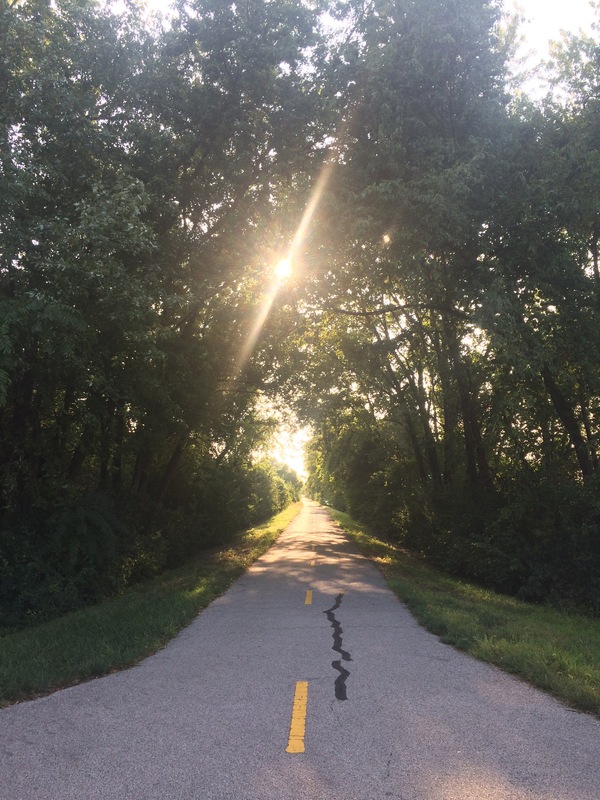 Just a day before, we had finished riding the beaten track of the Lewis and Clark route along the Katy Trail State Park and didn’t have another tested, established bike route to take until we reached Ohio. We knew more waving corn and soybean fields were in our future, but it was the uncharted territory that drew us forward, the untested highways and campgrounds and Warm Showers hosts that lay in our future. 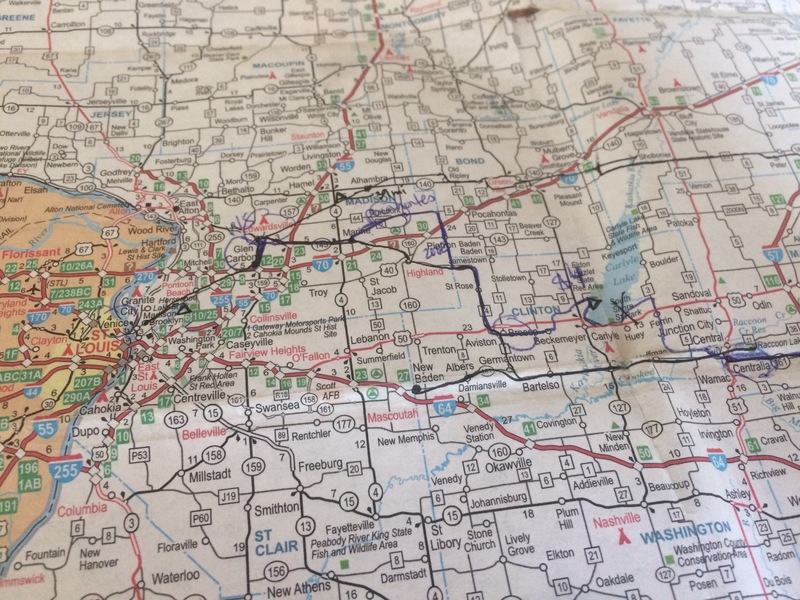 Pouring over bike forums and Google routes and the map, I was able to come up with a 500-ish mile route across Illinois and Indiana via Louisville, KY, which I hope to detail for you here. It’s by no means perfect or ACA tested, but we arrived safe on the other side to tell the tale. Rubber side down, folks! According to a forum post I’d read, published almost 10 years ago, a small contingent of eastern Illinois residents had hoped to establish a bike route that crossed the state. They’d selected the 161 corridor, that runs from New Baden to Mt. Carmel. Unfortunately, it doesn’t seem like this route has gained much traction, but I can attest that it is a fairly safe and straightforward way to begin traveling east from St. Louis. 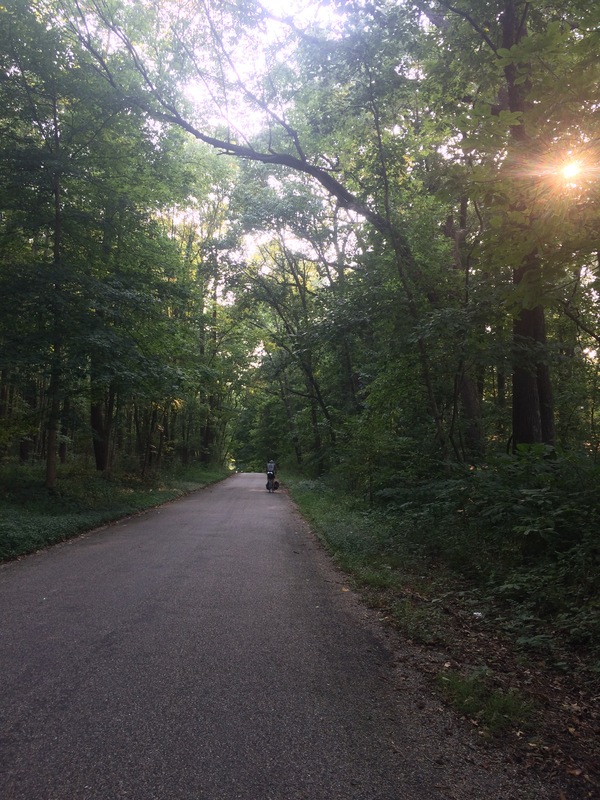 (St. Louis – Glen Carbon, 37 mi) We began our journey by traversing the busy city, rolling through Forest Park, the campus of St. Louis University, and busy downtown to reach a quiet bike path on the Mississippi. After token pictures at the Arch, we traveled north to the McKinley Bridge, which took us east into Venice, IL. A short jaunt through crumbling urbanity here, and we were on the web of dedicated trails of Madison County. Unfortunately, we were disappointed to find that the campground at Horseshoe Lake had closed and we scrambled to find lodging. Luckily, the generous community of Warm Showers came to our aid again and we stayed the night with the gracious, beer-loving host Scott at his home in Glen Carbon. 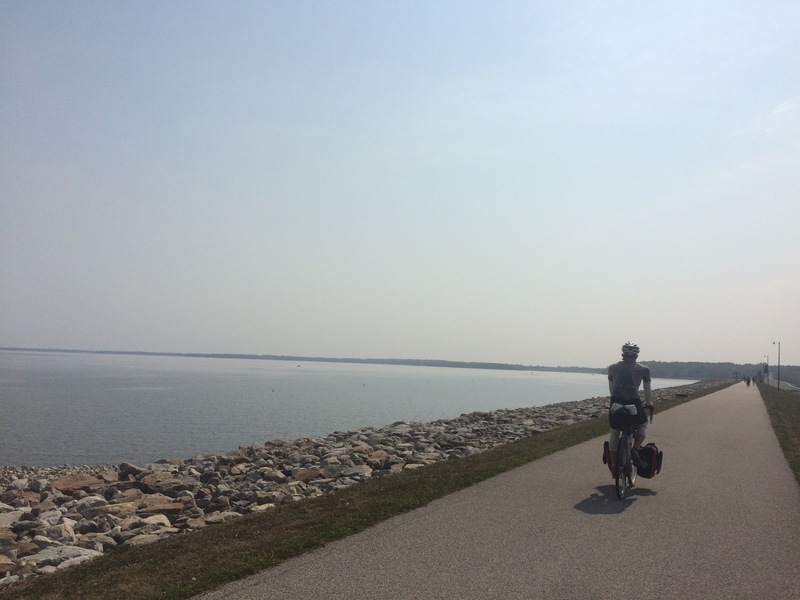 (Glen Carbon – Carlyle Lake, 62 mi) The next day, we rode the Madison County Trails again as far as we could to Marine, IL. Here, we took Pocahontas Rd. to Grantfork and then various county roads to get groceries in Breese. Our destination that night was the campground at Eldon Hazlet State Recreation Area on Carlyle Lake, and more research is necessary to determine which set of county roads would most efficiently get us to the lake. Our meandering route through Pierron and St. Rose to Breese were not the most direct, so I would recommend that travelers come prepared with groceries to prevent having to drop that far south before arriving at camp. It turned out that it was all for naught, as our neighbors at the campground ended up sharing their dutch-oven cooked potroast and vegetables! (Carlyle Lake – Sam Dale Lake, 61 mi) We departed this day from Annie and Sean, heading south along Carlyle Lake. We were able to pick up a bike path here, a melange of dedicated trail and bike lanes that followed the West and South edges of the Lake. We came out on Boulder Rd, which we followed South through Ferrin. Our route from here to Centralia, the next bit of civilization, followed quiet paved county roads (mostly College Rd) that were quite pleasant. We’d finally reached the 161 corridor! Centralia was a bigger town than I was anticipating, and we took a delightful lunch under trees in the Foundation Park before heading east on the highway. We had an nice shoulder for about 8 miles as the traffic was heavier, but we lost it after we crossed highways 57 and 37. Here, Highway 161 becomes 161 ext. We entered rural life again with its quiet roads, rolling terrain, and agricultural fields. Sam Dale Lake just west of Johnsonville afforded us a brilliant sunset as the insects began their nightly opera. (Sam Dale Lake – Beall Woods SP, 64 mi) Again, a daily push between campgrounds, as we took to quiet country highways and gentle rollers. Highway 161 ext took us through the towns of Johnsonville, Cisne, Mt. Erie, and West Salem, where we then deviated South on County Road 400E to Lick Prairie Christian Church, and then East on County Road 1750 N to County Road 1, which took us South to Mt. Carmel. We laid our heads amongst the lush greenery of Beall Woods State Park (after following Wabash Rd 10 south from town), an oasis of forest amidst an industrial hub on the border of Indiana. (Beall Woods SP – Indian Celina Recreation Area, 94 mi) We took on a big day, traversing more than half of Southern Illinois. 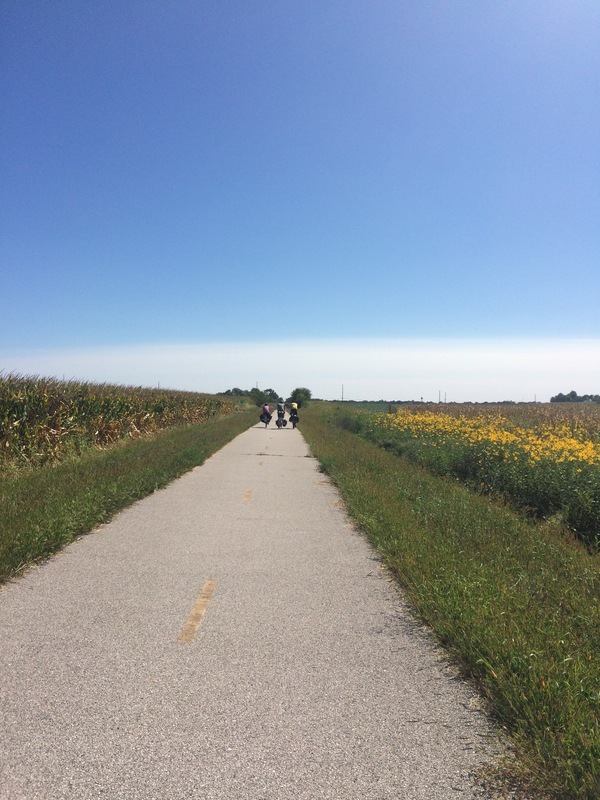 This portion of the journey could probably be broken up into two days, stopping at the campground in Lynnville, but a light tailwind, wonderful scenery, and generally rolling terrain drove us forward. We crossed into Indiana from Mt. Carmel on the Highway 15-64 bridge. Highway 64 on the Indiana side was the worst part of the day, contending for space with trucks and fast traffic. But once we reached Highway 65 South, we sailed back onto quieter rural roads through Owensville, IN. Just before Cynthiana, we traveled east along Highway 68 for the next few hours, taking in the towns of Haubstadt, Lynnville, and Dale. Crossing over Highway 231 in Dale, we reached the magical Highway 62, an inconspicuous highway that borders Interstate 64 across the eastern half of the state. The evening light illuminated golden fields, interspersed by dappled lush forests as we approached the Hoosier National Forest. I wish we could have stopped in the picturesque town of St. Meinrad with its old churches and winding, steep streets, but alas, our almost-century drew us forward. 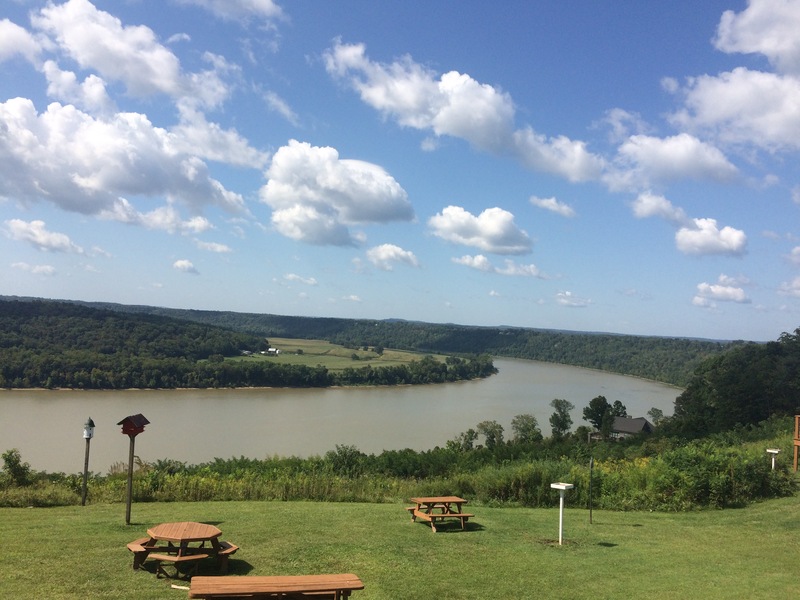 (Indian Celina Recreation Area – Louisville, KY, 67 mi) The morning brought us more cool forests and lush drainages through the towns of Sulphur and Leavenworth, where we glimpsed our first sight of the mighty Ohio River far below. The rest of the day was up and down, right and left, as we wound between and among the hardwood forests that border the river. The roads of Highway 62 were quiet until we reached the outskirts of Corydon, where we should have deviated from the highway onto Corydon Ridge Road. We could have avoided the rush-hour congestion all the way to Edwardsville. In Edwardsville, we spiraled down the Corydon Pike like corkscrews down to the river in New Albany, and then followed a relatively simple bike route (thanks Google!) across the Big Four Bridge into Louisville. We were even serenaded by classical music as we entered Kentucky! 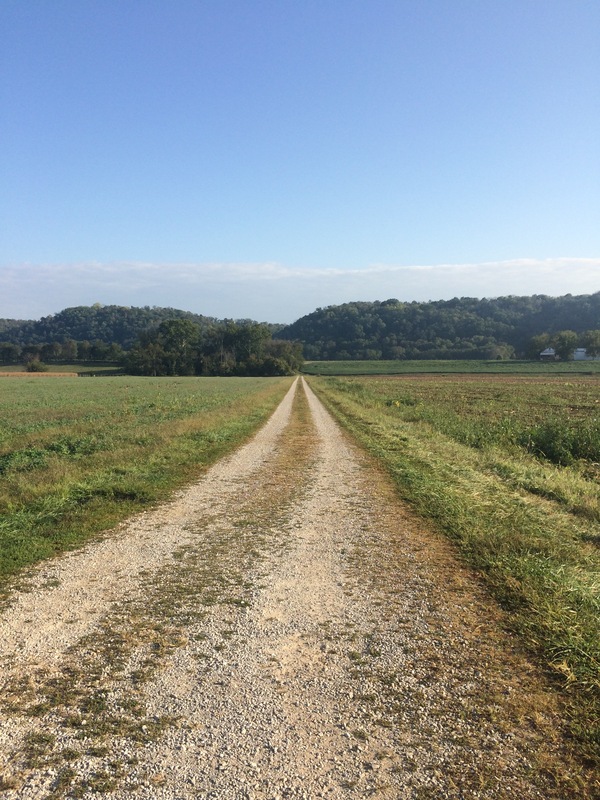 (Louisville – Madison, IN, 69 mi) I won’t say much about this day, except for the fact that it was a shame we had not invested in the Adventure Cycling Association’s Underground Railroad route, map 3. This would have avoided a harrowing ride along Highway 62 from Charlestown – Madison, IN. The morning was pleasant, though, as we took the Utica Pike out of Jeffersonville and then Upper River Road to the base of Charlestown State Park to Highway 62 again. Lesson learned: follow the Underground Railroad route, map 3, to find the best back roads between Charlestown State Park and Madison, IN. (Madison – Cincinnatti, OH, 88 mi) Aside from our travels through the Hoosier National Forest, this was the most pleasant day of our tour through Illinois and Indiana. 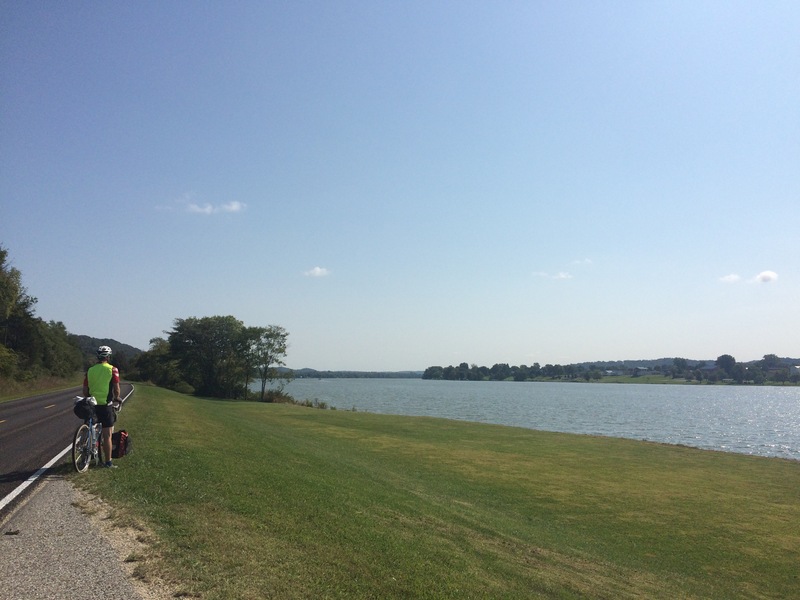 We took the advice of our gracious Warm Showers hosts, Bob and Charlotte, following a longer but very scenic route along the Ohio River into the State of Ohio. Highway 56 through Vevay took us to Highway 156 and lunch in Patriot, IN. Then, we met back up with Highway 56 where we went through Rising Sun and Aurora, IN. 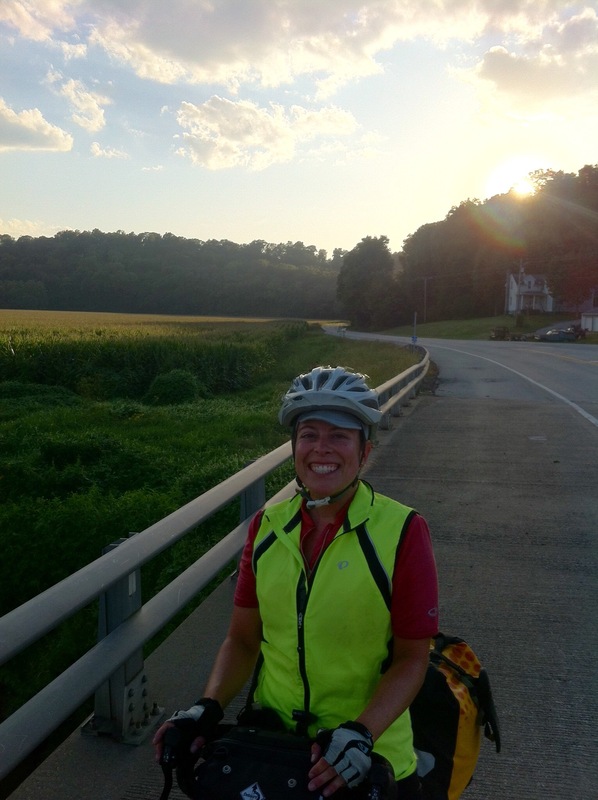 In Aurora, we caught a short bike path to Lawrenceburg, before braving Highway 50 briefly to Elizabethtown. In Elizabethtown, we were able to follow a rural route (thanks, Google!) into the city of Cincinnati. The next day, we would catch the Ohio to Erie Trail (look forward to a forthcoming post), so we celebrated with the local Reingeist Truth IPA for a successful and safe journey outside of the comforts of Adventure Cycling and other established routes. Rolling into any town, there is a sense of anticipation. We may be passers-through, but there are people who live here and will continue to live here for generations. Questions abound: What is going on in this town? Who will we talk to? Will there be a grocery store? What about an ice machine in the gas station? Will we find an outlet to charge our phones or a picnic table in a city park where we can take lunch? What about ice cream? As revealed above, this stretch was full of mystery and challenged my lulled sense of logistics and geographic planning. But oh boy, did my respect for ACA and the work they do for cycle tourists in the US just skyrocket. Tags: Adventure Cycling, bicycle touring, bicycles, gratitude, Make America Bike Again, questions, travel. Bookmark the permalink.